Our meeting on Growth in Crown Hill and the Seattle 2035 Comprehensive Plan on October 24th was very well attended. More than 70 people from our neighborhood and beyond came, and listened, and spoke. Seattle Department of Planning and Development sent along 3 staffers (Geoffrey Wendtlandt, Patrice Carroll, Susan McClain). Geoffrey Wendtlandt. The Mayor’s office sent along Chris Gregorich. Growth in Crown Hill, How Will it Affect You? The City of Seattle has issued its preliminary 2035 Comprehensive Plan and it has implications for Crown Hill. The plan provides long-term guidance about managing growth for the next 20 years. Crown Hill continues to be an urban hub designated to absorb significant growth. What does that mean for our community? 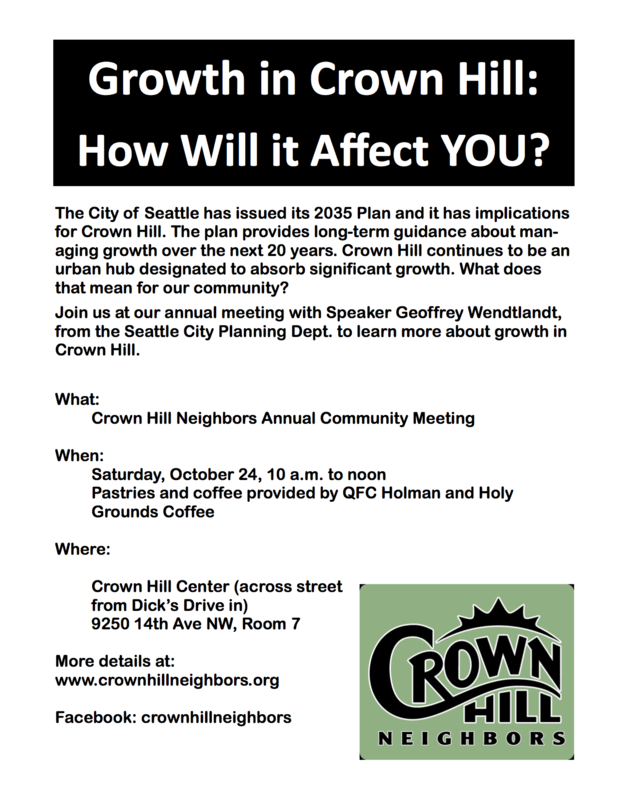 Join us at our annual meeting with speaker Geoffrey Wendtlandt, from the Seattle City Dept of Planning & Development to learn more about growth in Crown Hill. We’d love to have you and your neighbors there to start the discussion! 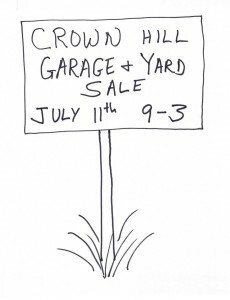 The 9th Annual Crown Hill Neighborhood Garage Sale is Saturday, July 11th, 9-3. Check out the sales. Buy some lemonade. Have fun! Bring home some new-to-you treasures. Lots of options for maps. 3) To get a printed copy: Go to 9250 14th Ave NW, between 8:30 and noon and look for the green box on the planter to the left of the building entrance. Best of luck and thanks for all the people who have listed sales. Crown Hill Neighborhood Garage and Yard Sale, July 11, 2015, 9-3 — Click on map for interactive version. Garage sales fill that need to turn one person’s castoff into another’s treasure. Whether it’s baby clothes your high schooler outgrew years ago and a young family could use, or that bike that clutters your basement and someone without a car could use, or …. You get the idea. Start rounding up the stuff. Talk to your neighbors about doing a multi-family blowout sale with BBQ and a really festive atmosphere. See if the kids are up to selling lemonade, cookies, etc. to contribute to their iPad fund. Crown Hill Neighbors has been organizing the annual garage sale since 2007! We were one of the first in Seattle to publish an online map of all the sale locations – something much copied about town. It’s a lot of fun to cruise the sales and talk to your neighbors if you don’t have the time to put together a sale. Spring is on the way! Are you starting to get in the mood to grow some food? 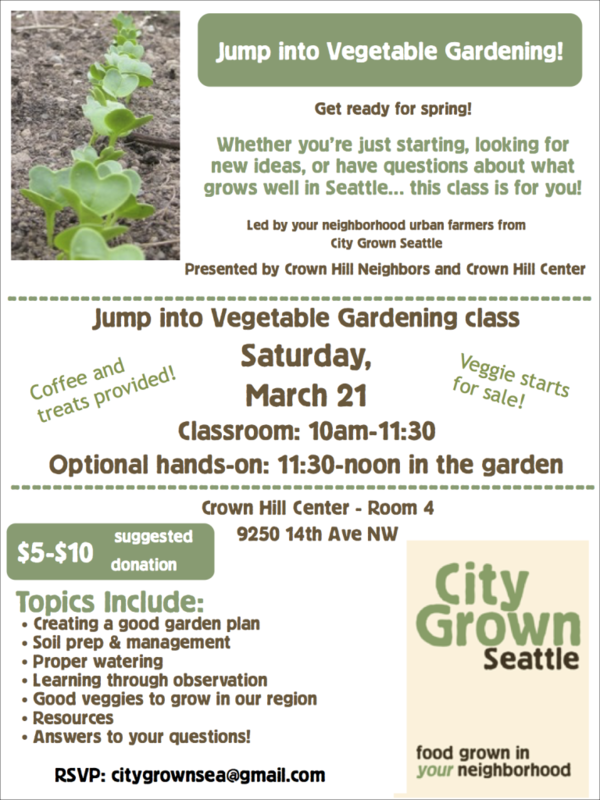 If you are ready to try out a veggie garden for the first time or improve your gardening skillset, join us for “Jump into Vegetable Gardening!” on Saturday, March 21 from 10am – noon, hosted by City Grown Seattle, Crown Hill Neighbors and Crown Hill Center. So whether you’re just starting, looking for new ideas, or have questions about what grows well in Seattle… this class is for you! We will be happy to answer your specific questions to the best of our ability!